Vasant Panchami announces the arrival of Vasant Ritu or the Spring Season. The biting cold of the winter disappears and sunshine appears. It is a period of regeneration. Flowers, green leaves and fresh fragrance signal, prosperity, hope and love. The festival gets its name from ‘Vasanti’ (yellow) – the color of the fields of mustard crop. It is also the period when mango trees start flowering. It is also the period when numerous other fruit trees start flowering and puts a fresh coat of green leaves. The period also heralds the season of love – because it marks the return of vitality and vigor after the harsh and lethargic winter. Vasant Panchami is also an occasion for worshiping the Hindu God of Love, Kamadeva, and his companion Rati. 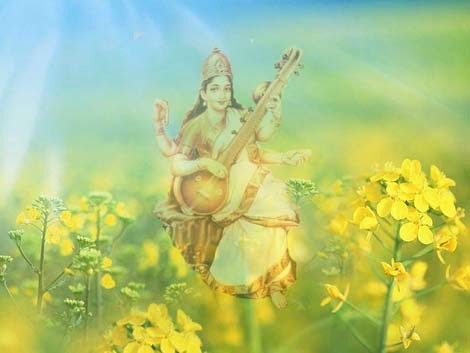 Goddess Saraswati — the deity of knowledge – is worshiped on the day. It is an auspicious occasion for the learners of music and other art forms. The period also marks the songs of the returning birds. Yellow is the color of the period as it stands for prosperity and love. The color is also associated with learning and knowledge. The day is also dedicated to the departed souls of ancestors, parents and relatives. Our peace and prosperity is due to the blessings of them. When everything is afresh, we remember them.